Cash Is Now Scarce In India. : Goats and Soda Paper money is scarce as a result of a government edict. But a couple of major obstacles stand in the way of the cashless society. 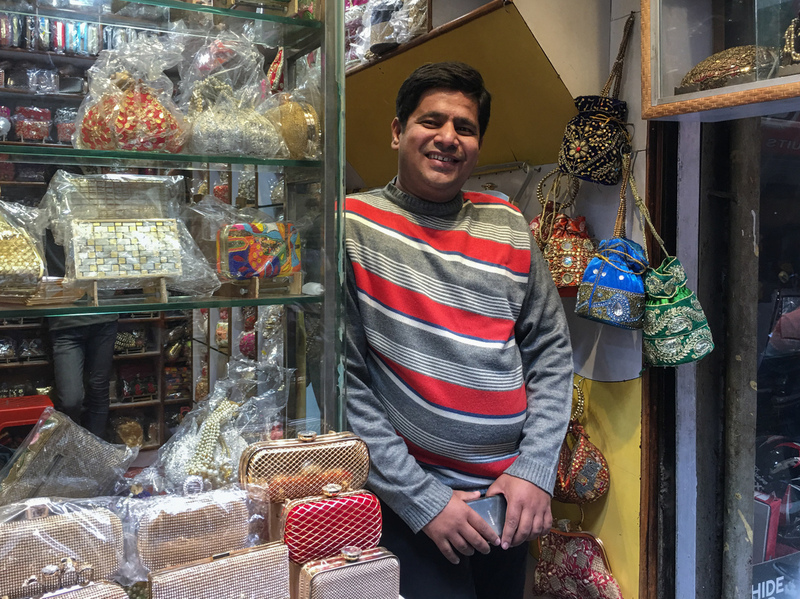 In the Old City of New Delhi, Asim Husain stands in his shop, where he sells hand-stitched purses. He says sales normally conducted in cash are down nearly 90 percent and his attempts to go "cashless" with credit cards or other e-wallet schemes have not met with great success. "The connectivity is very poor," Husain says, referring to the internet. Imagine living in a world where you need cash to buy virtually everything — from food to clothes to a new home. Yet you have no cash. The best you can do is stand in line at the bank for hours in the hope of withdrawing a small amount of paper money. Maybe you could use a smartphone to pay for goods — only you're too poor to afford one. Welcome to India, land of the cash crunch. In November, the government declared that India's highest value notes, the 500 and 1,000 rupee bills — roughly the equivalent of $7.30 and $14.70 — would immediately be pulled from circulation as legal tender and began to slowly replace them with 2,000 rupee notes. The government also capped the amount of cash that citizens can withdraw from their bank accounts. The goal was to crack down on tax evaders who keep their assets in cash. The unintended consequence has been a serious cash crunch shortage that's caused upheaval across the land. India, the world's fastest growing economy, is stuck in neutral: Queuing in line for money has become a ritual. Wholesalers and retailers have stalled. Everything, from real estate deals to weddings to surgery, is on hold. And now the government is saying there's a new reason for this move: moving India to a cashless economy. That's good news for PayTM — or Pay Thru Mobile — an app that lets people make transactions without cash. "In the span of last four weeks, the traffic has gone 19 times more on our platform, that's a 1900 percent growth," says the cheerful Vijay Shekhar Sharma, who started the app in 2011. His sunny disposition may have been made sunnier still by the fortunes of his company. PayTM is already reputed to be the largest digital commerce platform in India. And Sharma says it's adding a half a million new customers a day. "That's a growth which effectively will give us a half a billion people in the next few years on our platform," Sharma laughs, almost in disbelief. He's gone from a modest one-room headquarters to an entire building. Sharma says the PayTM app requires only a smartphone, internet access and a reciprocating retailer, restaurant, or vendor who's also enrolled. The customer transfers money to Pay TM to pay for a variety of goods and services. But smartphone owners represent a minority in the Indian market — 17 percent of the population, according to the Pew Research Center. It found that India stands among the lower half of surveyed countries in internet usage. And among those Indians with lower education levels, only 9 percent are online. Sharma's rosy assessment also assumes access to a stable, strong internet — and a huge customer base that is hip to technology. Bhaskar Chakravorti, senior associate dean at the Fletcher School at Tufts University, says such assumptions ignore realities on the ground. Chakravorti, who co-authored a report titled "The Cost of Cash in India," found that, "most Indians lack the means to use cashless alternatives irrespective of their desire to do so." "The digital infrastructure in India is so horrendously poor," Chakravorti says. "The majority of people don't have access to smartphones. Large numbers of them cannot read or write. Mobile connections are extremely poor. Even the people in the city, for them connections are terrible." Chakrovorti says policy-makers pushing a cashless society are "essentially putting the cart before the horse. The country needs to invest in its digital infrastructure before it pushes people to digital payments." The Pew Trust survey also found that just over a fifth of Indians have access to the internet, with many more men online than women. "If you think about the fact that women are ... primarily responsible for making household purchases," Chakrovorti says, "how can one expect digital payments to penetrate in a meaningful way when only 17 percent of women have access to the internet?" In terms of how Indians access their money, the World Bank's Global Financial Inclusion Database (Global Findex) found that just 9 percent have a debit card, and only 2 percent have a credit card. Saksham Khosla with the India Center of the Carnegie Endowment for International Peace expects that any push to go cashless will likely deepen the digital divide between urban and rural India. He notes that 70 percent of all connections exist in cities. "So we're really thinking of a digitally excluded India being dragged kicking and screaming into the 21st century," Khosla says. Chakrovorti says, however, India needs to wean from its cash-obsession — only Japan is more cash-dependent. Trying to force people to make digital transactions is likely to be an exercise in frustration, he believes. That's certainly been the experience of Asim Husain, whose small shop tucked in Delhi's Old City sells intricate hand-stitched purses. The hands that do the stitching have not been paid in over a month. Husain doesn't have the cash to pay them because his own sales, normally conducted in rupees, have plummeted, by 80-to-90 percent. Clients he says, "don't have cash." Husain wanted to see if credit cards would help after the government pulled more than 80 percent of the cash from the economy. "The very next day we applied for the credit card machines, and the banks have not provided us till now," he says. "It's been one month." He's also subscribed to signed up for PayTM — but his experience is the sort that could undermine Indian faith in the reliability of e-wallet platforms. "One of my clients sent me the payment of 2,800 [rupees or $41], the amount got deducted from her account, but it doesn't come to me," he says. "The amount is [has] still not been credited. The connectivity is very poor." Husain added, "If we want to make digital India, we have to make our servers very good." Shushil Kumar Verma, a tech-savvy grandfather who runs a shop that sells imitation jewelry in the Old City, has had decent luck with the digital payment app. He suspects it's because he's located on the main road, where stronger mobile signals can be found. But last week hundreds of PayTM customers across the country poured out their grievances against the company on social media. CEO Vijay Shekhar Sharma took to Twitter to explain that India's largest digital commerce platform had seen "superhigh traffic" as it was installing new capacity. The purse shop owner Asim Husain, meanwhile, observes, "We are in the capital and facing problems. What about the villages? And the rural areas." And he adds, "Everybody is suffering."